Calcium Chloride (chemical formula CaCl2) is the ionic compound of calcium and chlorine. It is a salt that behaves as a typical ionic halide, being solid at room temperature and highly soluble in water. Common applications include brine for refrigeration plants, ice and dust control on roads, and desiccation. In the oil industry, the chemical is used in establishing and maintaining oil and gas wells. It helps well fluids gain needed consistency, increases density and stabilizes shale formations. As a completion fluid it seals well casings and displaces drilling mud. In short, iran Calcium Chloride is used in several applications for new or existing wells to improve efficiency and production. Calcium Chloride Prills are used in gas and oil drilling. It helps keep gases from forming and helps sludge from getting out of hand. Calcium Chloride is used in drilling Fluids to cool and lubricate the bit and to remove cuttings from the hole. also it helps add density to the mud to overcome formation pressures and keep oil, gas, and water in place. 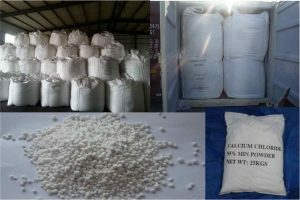 Calcium Chloride inhibits clay and shale hydration, adds needed weight to overcome formation pressure, aids in carrying cuttings to the surface, and is easily diluted from more concentrated solution. CaCl2 additive decreases thickening time, increases ‘early strength, and shortens the time wasted at the wellsite as operators wait for cement properties to take hold. Our CaCl2 additive can be adjusted to meet specific conditions and requirements. Mixes with low concentrations decrease slurry viscosity, while mixes with higher concentrations increase slurry viscosity. Calcium Chloride is used in establishing and maintaining oil and gas wells. It helps well fluids gain needed consistency, increases density and stabilizes shale formations. As a completion fluid it seals well casings and displaces drilling mud. In short, Calcium Chloride is used in several applications for new or existing wells to improve efficiency and production. this commercial chemical Prills are used in gas and oil drilling. It helps keep gases from forming and helps sludge from getting out of hand. CaCl2 additive is effective at temperatures between 40° and 120°F (4° and 49°C) in concentrations of 2% to 4% by weight of cement (bwoc), or equivalent liquid concentrations of 40 gal/100 sk (2%). Calcium Chloride is used in drilling mud to cool and lubricate the bit and to remove cuttings from the hole. Calcium Chloride helps add density to the mud to overcome formation pressures and keep oil, gas, and water in place. Calcium Chloride inhibits clay and shale hydration, adds needed weight to overcome formation pressure, aids in carrying cuttings to the surface, and is easily diluted from more concentrated solution. CaCl2 is used as a completion fluid just before the producing formation is reached to flush the hole clean of solids so the casing can be cemented into place. As a clear, solids free brine, also is ideal as a completion fluid with a density range of 10 to 12 pounds per gallon and suppling by our company to all over the world with best qualities and competitive prices. Iran calcium chloride has one of the finest qualities in the world, also we have professional analyzer expert to guaranty this. and in price talk, because of the logistical situation and country diplomacy we always have the most competitive price in continent. With these elements of business, we always satisfy our customer in best way.